At Rab’s Country Lanes we have open lanes available to the general public 7 days a week! Check out the Schedule of availability below along with our rates to play. Bowling is a great activity for all ages! Introducing children to the sport of Bowling? 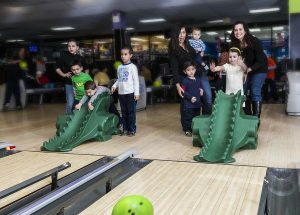 Bumpers are available on all 48 lanes, they help guide the bowling ball down the lane without the worry of the dreaded gutter-ball and they are automatic! Bumpers go up for children (ages 12 & under) and down for adults… Imagine that? Ask about the Dragon Bowling Ramp for small children. Bowling balls are available starting at 6 lbs. up to 15 lbs. for your use. For your own safety, we ask that all bowlers wear bowling shoes and are available for rental use. 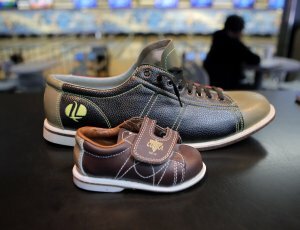 Bowling shoes come in all sizes too, toddler size 5 to an adult men’s 20! Please call for lane availability on day of planned visit. Click for Printable Open Play Schedule! Rent a lane by Time. The rate is per lane, per hour. for up to 4 people. $5 per additional person, up to 6 per lane. Have a Free Game of Bowling Coupon? These coupons are only valid until 6:00 PM. Up to 6 people may bowl on a lane at one time. Reserve your Lane for Open Play Today! Invite your friends to bowl with you at Rab’s!